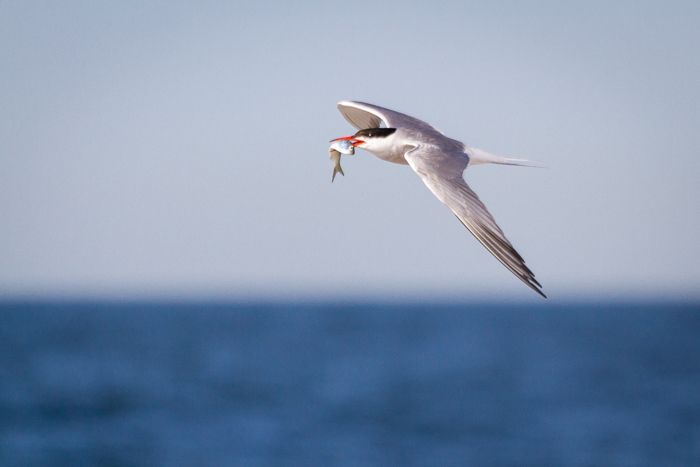 "Bringing Home The (Aquatic) Bacon"- A common tern returns to the colony site from the open ocean with prey. Photographed from the edge of the beach with a Sigma 70-300mm f/4-5.6 DG APO lens, handheld, Canon 7D, f/5.6, 1/3200 sec., ISO 400. On my recent trip to Nickerson Beach Park, I made two important observations about my fellow nature photographers. First, even though there were a fair amount of photographers there that day, the vast majority arrived well after the best light, and many were arriving as I was leaving for the day. Second, and more importantly, the majority of the photographers stood upright the entire time and moved pretty rapidly up and down the beach, chasing the areas of perceived action or new subjects. 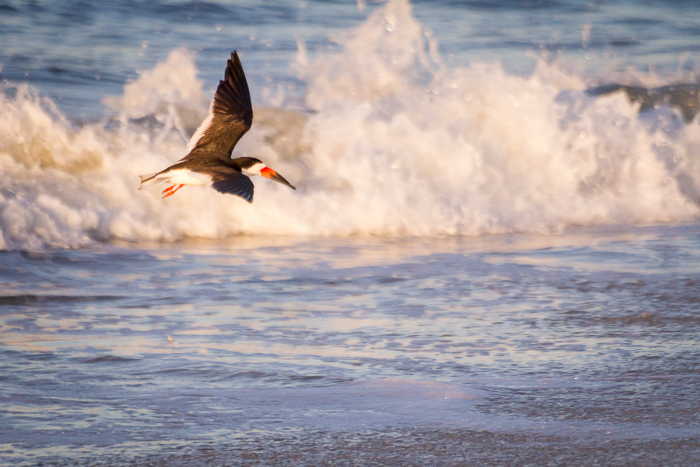 "Cruising The Shoreline"- A black skimmer flies along the shoreline in front of the crashing surf after a feeding sortie near sunrise. Canon 7D, Sigma 70-300mm f/4-5.6 DG APO lens, handheld, f/5.6, 1/2500 sec., ISO 1600. 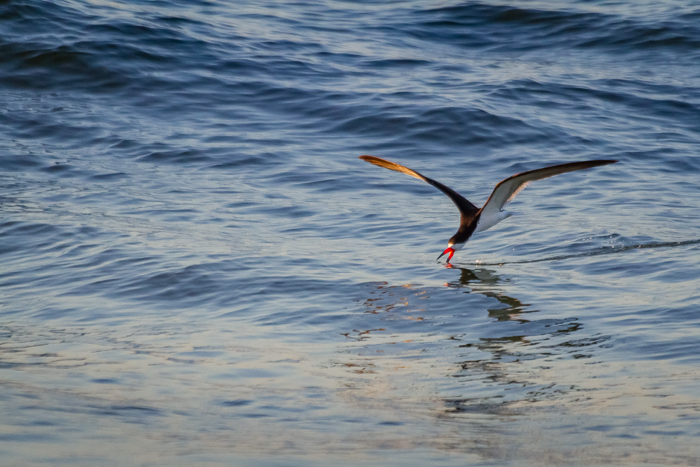 "Skimming The Waves"- A black skimmer demonstrates their distinctive feeding style in the trough between waves at Nickerson Beach Park. Canon 7D, Sigma 70-300mm f/4-5.6 DG APO lens, handheld, f/5.6, 1/2500 sec., ISO 1600. So why did all these photographers arrive so late? Yes, admittedly for the first half hour or so, it was difficult for me to get good action shots with my original version Canon 7D. However, a lot of these photographers were carrying much nicer equipment than I, with newer camera bodies with much better high ISO performance. Plus, what about more stationary subjects? Even with action subjects, you may miss over 90% of your shots; but what about the one or two where the light combines with the action to produce something truly sublime, and not something that every other shooter has in their portfolio? Not to mention the time spent establishing the animals behavior patterns and flight routes, plus habituating them to your presence, that leads to better images as the light gets stronger? 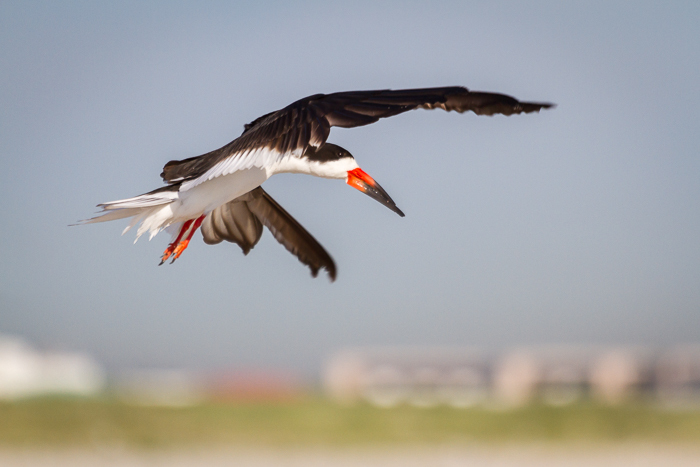 "Skimmer And The Strip"- A black skimmer comes in for a landing on Nickerson Beach with the Lido Beach strip in the background. Canon 7D, Sigma 70-300mm f/4-5.6 DG APO lens, handheld, f/5.6, 1/3200 sec., ISO 400. I find that I often have more success and a better experience with wildlife photography if I find a great area for animal activity, and then wait for the wildlife to come to me. 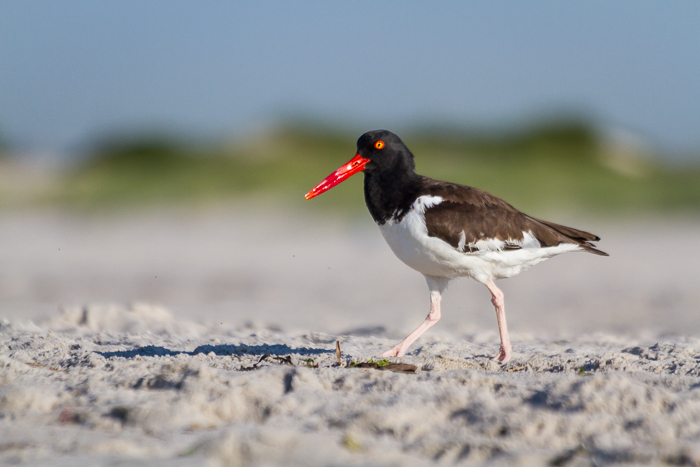 In this case, I found an active area of the beach where there was some oystercatcher activity and where many of the terns and skimmers would head out over the beach to forage on the water and then return to the colony. I got low to the ground (mostly sitting and kneeling) and stayed very still. I felt a bit like an idiot, especially once the joggers and regular beach-goers began to arrive, but I also wore a ghillie suit to break up my outline and make me appear less threatening. Did I think the birds actually couldn't see me against the light sand beach? Absolutely not, but I hoped breaking up my human outline might help them see me as less of a threat and make it easier for them to become habituated to my presence. I also hoped this might have a little less of an impact on the birds normal behavior patterns. Sure, there were lots of people running and biking on the beach that didn't care one whit for the birds behavior and comfort, but as a nature photographer and conservationist, I figured I should do my best not to add to the problem. Most of my fellow photographers on the beach that morning spent their time fully upright with their tripods fully extended. 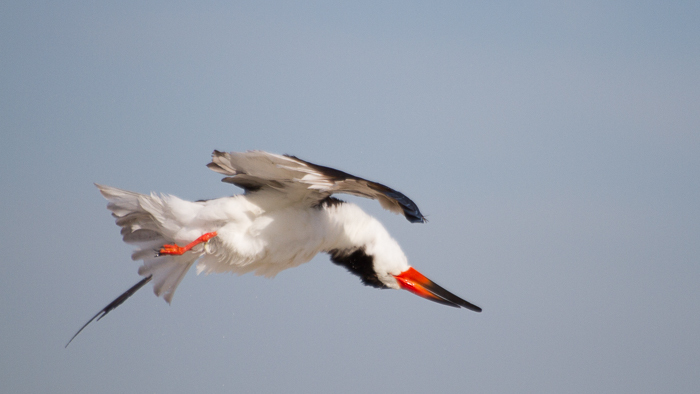 Most walked right up and stood at the rope marking the boundaries of the nesting colony. They moved frequently, chasing the areas of most intense activity. Most were wearing modest khaki or green field clothing, but some hadn't even bothered with that much. In many cases, it was clear that the birds were reacting to their presence. For some with the really long lenses, this strategy may have resulted in some good images. I don't know. But I wonder what images they missed and how much of an impact they had on the birds they (at least should) love. Sure, the activity would occasionally dip at my stationary spot. Flight patterns and intense activity would shift out of reach. But by being patient, good action would eventually come back to me and I managed to get some really great shots with only a 70-300mm zoom (admittedly 300mm being equivalent to a 480mm lens with the 1.6 crop factor on a Canon 7D). By letting the wildlife come to me, I had less impact and more keepers with a relatively short lens, and frankly enjoyed myself and observed more behavior as well. Next time you're out photographing wildlife. Particularly if you don't have a super-telephoto lens. Think about staying low, staying still, and waiting for the action to come to you. Hi Eli, Great post. Hope to get to San Diego or perhaps the Colorado River delta in the not too distant future. Working on a series of six panos that depict the different habitats here in southern Az. First two currently hanging at the museum and once series is complete it will be submitted to hang at the Tucson airport. Keep the photos coming and say hello to the family for me.